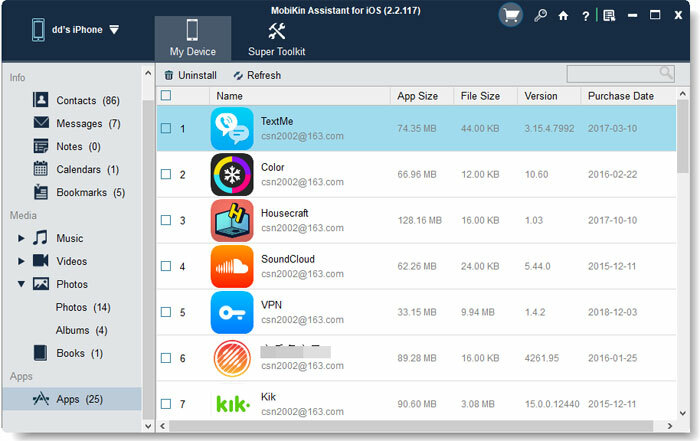 MobiKin Assitant for iOS (Free) is a totally free iOS Assitant tool for Windows users. With it, you can transfer up to 10 types of files from your iDevices to computer with one simple click. Fully compatible with iOS 12 and iPhone X, iPhone 8/8 Plus! To give you the best iPhone, iPad and iPod management experience is the purpose that the MobiKin Free Assistant for iOS is made for. With it, you can directly backup up to 10 types of files from your iDevices to desktop computer and manage them without hassle. Transfer more than 10 types of data to desktop computer for backup, including photos, music, movies, contacts, text messages (SMS), safari bookmarks, notes, voice memos, playlists, books, etc. Import files like contacts, messages, books, notes, bookmarks, etc. from PC to iPhone, iPad or iPod with 1 simple click. The exported files on your personal PC can be viewed, played, edited or shared with anyone you like freely. Directly add, delete or edit existing iOS data like contacts, photos, messages, etc. on PC as you like. Uninstall apps from iDevice selectively or in a batch. This iOS Assistant freeware is the World's 1st solution to make you get rid of the sync of iTunes. It can directly move files from your iPhone, iPad or iPod to the desktop computer without losing. And it will never erase anything on your device during the whole data transferring process. 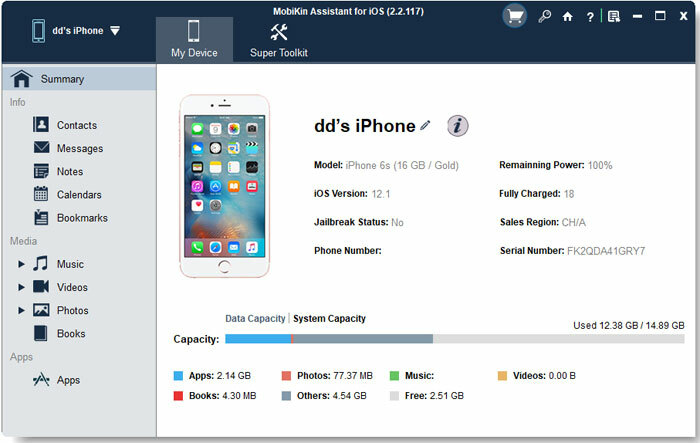 Standalone program to help you backup your iDevice data to computer without data losing or erasing on the device, so that you can reuse the data as you like. After owning it, you'll never worry about your data will be losing during the sync anymore. No require of other additional 3rd-party program. When your iDevice is detected by the program, all files on it will be categorized and displayed in the left panel. You can enter these folders to preview detailed info or directly type the file name in the searching box to locate your target files as you like. Thumbnail and list view mode to satisfy your different viewing needs. And you can use them to go through all files on your device and decide which one is the data you wish to backup. If you can remember the full name of the document you want to transfer, you can type one or two keywords in the searching box to directly locate the file ASAP. iPhone: iPhone X, iPhone 8 Plus, iPhone 8, iPhone 7, iPhone 7 Plus, iPhone 6S, iPhone 6S Plus, iPhone 6, iPhone 6 Plus, iPhone 5S, iPhone 5C/5, etc. Users of MobiKin Assistant for iOS (Free) Have Surpassed 740,000+ Worldwide. After that, you can start your own iDevice managing process at once. In order to improve the success rate of connection, please ensure that the latest iTunes have been installed on your PC. If not, just upgrade it before starting the process. How to Make Your iDevice be Recognized Successfully? Note: Please ensure you have installed the latest iTunes on your computer. Otherwise, you will get the following prompt after the launch. Step 2. By default, this tool will detect your linked iPhone, iPad or iPod automatically, and then a pop-up window will appear on your PC. Just follow the on-screen prompt to trust this computer on your iDevice, then click "Continue" button to go to the connection process. In most situations, your iDevice will be detected and displayed as below. But, if you can't see the above popup, or even though you have trusted this computer, but your device still cannot be recognized, you can go to here to learn what to do if the device fails to connect. How to Transfer & Manage Information (Contacts, SMS, Notes, Calendars, Bookmarks)? Here, we'll take the contacts info as an example. Step 1. Launch MobiKin Assistant for iOS and connect iPhone/iPad/iPod to computer. Step 2. In the left panel, you can find various file categories, such as contacts, messages, notes, calendars and bookmarks. You can select them and preview the detailed contents as you like. Step 3. Turn off iCloud contacts, notes and bookmarks on your iPhone, iPad or iPod by following the prompts. Step 4. Now, you can transfer and manage iDevice's contacts, SMS, notes, calendar or bookmarks as you like. 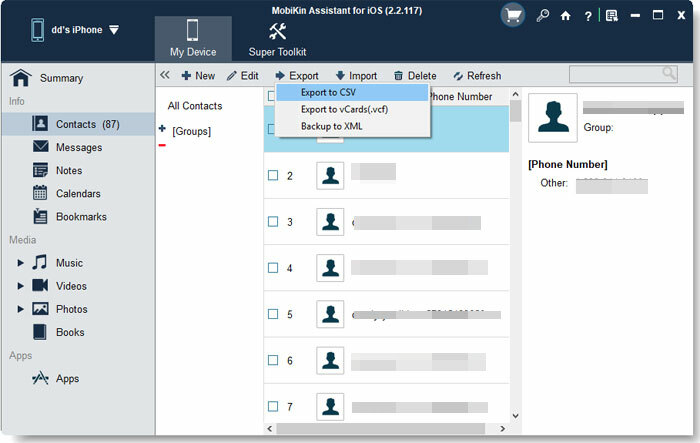 Export - Transfer data from iOS device to computer and saved as different formats, such as HTML, CSV, VCF, XML, Text and so on. 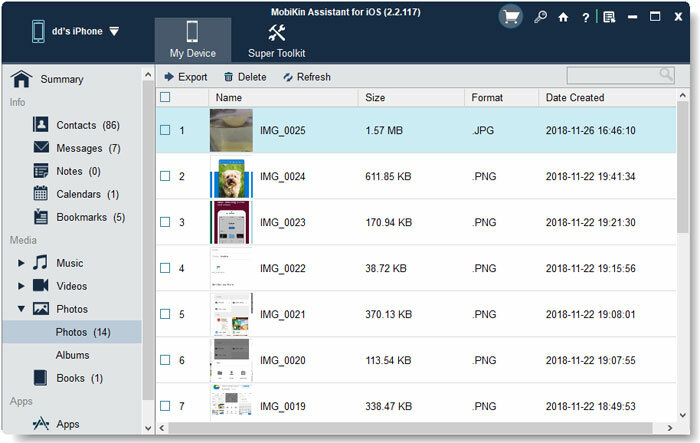 Import - Load files from PC to portable devices with 1 simple click. At present, only support load files in XML format. Refresh - Sync all settings have done on your device or in this program and get the latest data. How to Transfer & Manage Media Files (Music, Photos, Videos)? Step 1. Launch MobiKin Assistant for iOS, and connect iPhone, iPad or iPod to computer and make it be recognized. Step 2. 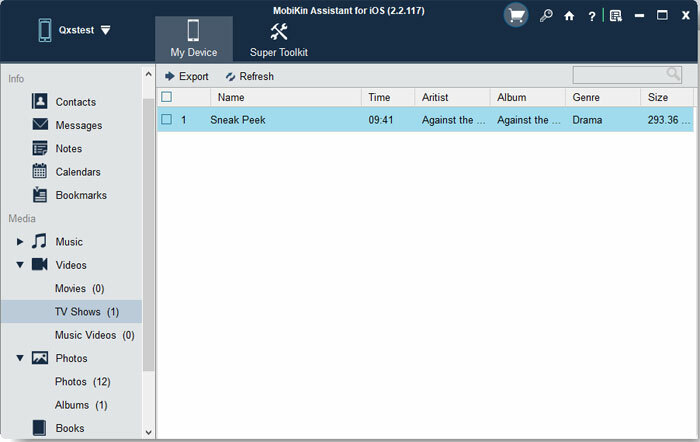 Choose Music, Photo, and Video category in the left panel to load all media files to this program. Then, you can preview them in the form of different folders. Step 3. Tick the photos, music or videos you wish to transfer, and click "Export" button to transfer and save them on your personal PC. Here, you can decide and select an output folder to save these output media files. - Photo: You're allowed to delete iOS photos from PC directly. 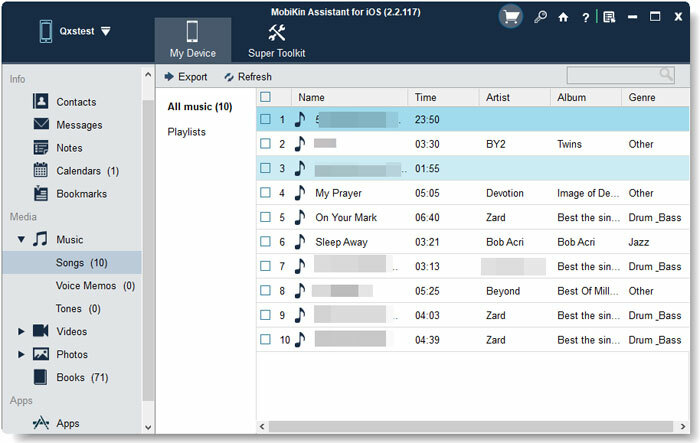 How to Manage iPhone, iPad or iPod Apps on PC? Step 1. Launch MobiKin Assistant for iOS, and connect iPhone, iPad or iPod to computer and make it be detected. Step 2. Select Apps in the left panel to load all apps on your iDevice to this program. Step 3. Find and tick the app that you don't want to save, then click "Uninstall" button to remove the selected items from your device. How to Manage (Backup, Restore or Delete) iTunes Backups on PC? Step 2. Choose "iTunes Backup & Restore", then a pop-up window will appear on your PC. Here you'll get a list of all iTunes backups on PC. Step 3. Click "Backup" button to decide the device you wish to backup, and where you wish to store the backup files. Then, click "Backup" to begin the process, and don't disconnect iPhone, iPad or iPod during the process. Step 4. Click "Restore" button on the top menu, you can choose an iTunes backup for restoring to your iDevice. - Fix the memory leaks if disconnecting the device while loading SMS. - Fix the problem that program fails to load other types of file while loading SMS. - Fix fail to pop up the authorization interface probelm after rejecting the request. - Solve the problem that cannot load other types of file while scanning SMS. - Filter out the devices that are connected to Wi-Fi. - Fix drag and drop eBook problem. - Support iTunes backup & restore management. - All-new free version of MobiKin Assistant for iOS. - Allow users to get free license code by sharing pages on Facebook, Twitter or Google+. - Backup, import/export, edit data as you like.